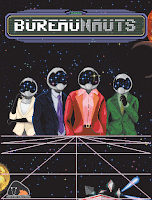 WARNING: This is a preview of Bureaunauts. All components and rules are prototype and subject to change. Space: the final career frontier. These are the voyages of the over worked and under paid. Their multi round mission: to explore strange new worlds, to seek out Solar Jellies and Space Pirates, to boldly climb the corporate ladder. 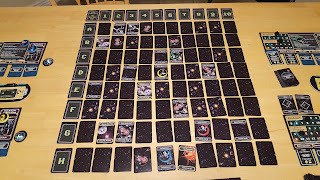 To begin setup players will place the Space Directions Card in the top left corner of the playing surface. Next the Border Cards A-H will be placed in a column below the Space Direction Card while the 1-10 Border Cards will be placed in a row to the right of the Space Direction Card. 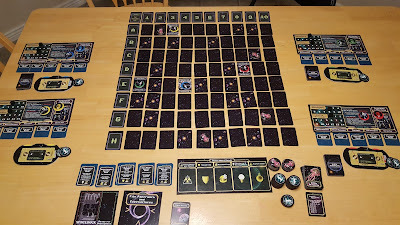 Players will now shuffle the 80 Solar System/Space Exploration Cards and place them out on the playing surface in an 8 by 10 grid next to and beneath the the previously played Border Cards. This constitutes the section of space you will be exploring throughout the game. 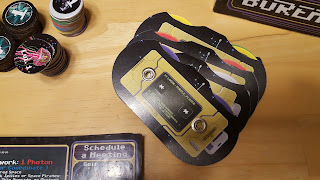 Each player now takes a Dual Dial, Spaceship Tokens, Schedule Meeting Token, deck of Influence Cards of a color and a player board. Players also take two black cubes and place one on the "0" space of the Jelly Track and one on the "2" space of the Budget Track on their player board. The Department Heads Board, Almighty Photons, Jelly Activity Deck, Jelly Tokens, Spacedock Board, and Expenditures Board are placed near the playing area. Lastly five career goal cards are dealt to each player with the remainder being placed in five separate piles near the playing area. Players then take the five career goals and arrange them face down under the "Career Plan" space of the player board. 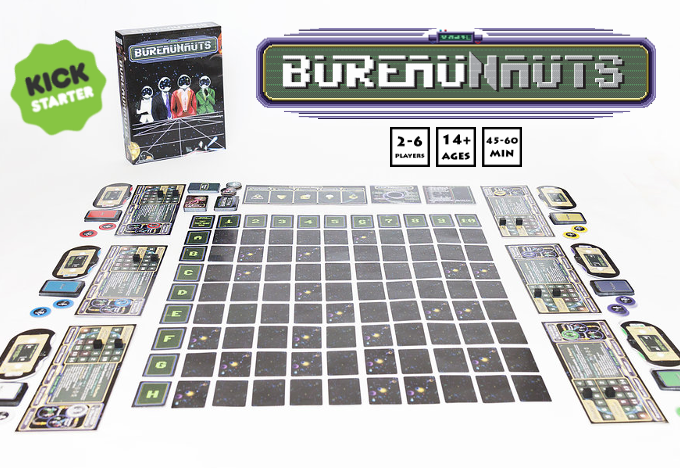 4 player set up of Bureaunauts. Players are now ready to start the game. In Bureaunauts players work to gain influence of the five department heads in efforts to become the next CEO. Influence is gained as players achieve their Career Goals and advance along on their Career Plan. Career goals can be anything from upgrading their spaceship to exterminating space Jellies. Let's take a look at how it plays. Solar Jellies move and spawn. In this step players turn over the top most Solar Jelly Activity card and resolve both the movement of the current Jellies and spawn new Jellies. Players receive their budget. Players receive Almighty Photons equal to where the marker is on their budget track. File Paperwork. Players pay an Almighty Photon in order to take an action OR they can choose not to pay anything in order to pass. Players choose an action/destination with their Dual Dial (similar to the action dial used in Pirates Cove). Actions include exploring/moving to a sector in space, upgrading their ship, reassigning a Career Goal, adjusting Career Goals, doing the Under Budget Career Goal, repairing damage, or having a business lunch. Repeat steps 3 and 4 until players run out of Almighty Photons or choose to not to take an action. 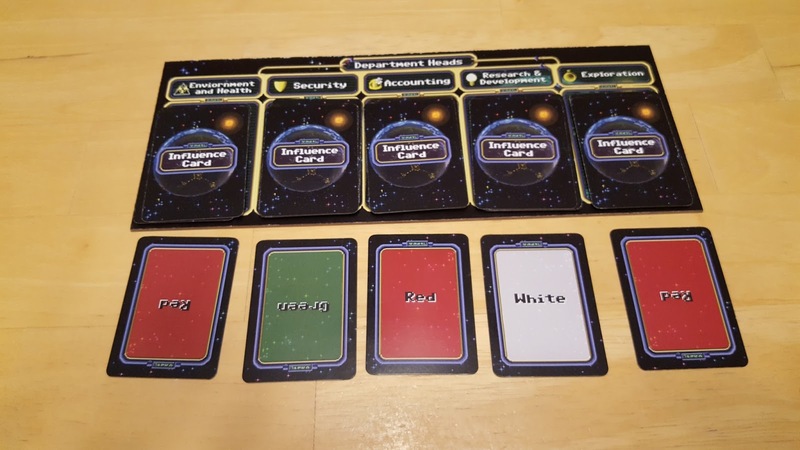 Players use the above actions to complete Career Goals which in turn allow them to play Influence Cards of their color into the Department Head slots. These cards are placed face down on the Department Heads Board and will be used at the end of the game to determine the outcome of the "Vote" (IE determine the winner). Also as players complete Career Goals they will move up their Career Plan path from Bureaunaut to Director. When a player has completed their fifth Career Goal and has moved up to Director the end of the game is triggered. Players will finish playing the current Fiscal Period and the game ends. At this point players shuffle each pile of Influence Cards on the Department Head slots, then one card is drawn at random from each pile which becomes the vote for the player of that color. The player that has their card pulled from three of the five Department Heads wins. If a player has two influence cards chosen then that is considered a soft majority and another vote is taken. Two soft majority wins equals a game win. There are more rules for ties and whatnot but you get the gist. 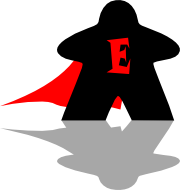 (IE having won 3 of the 5 Department Heads). 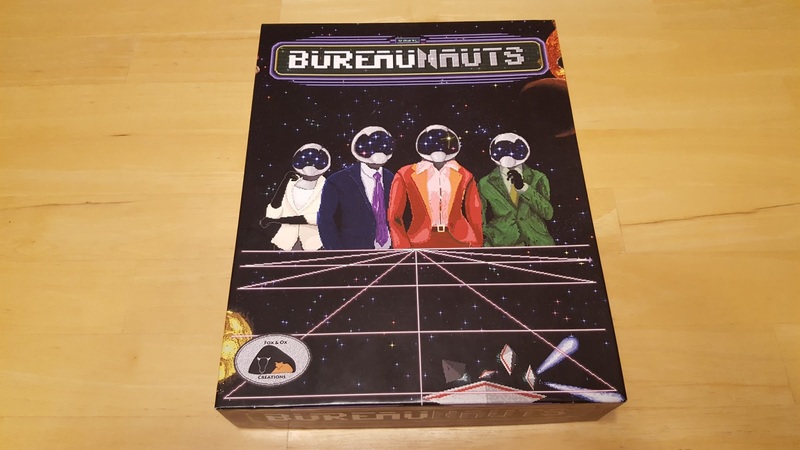 The copy of Bureaunauts I received is a prototype copy, however I am pretty sure that most of the artwork is complete. I did here from the game's creator that the components will be upgraded from the version I received. 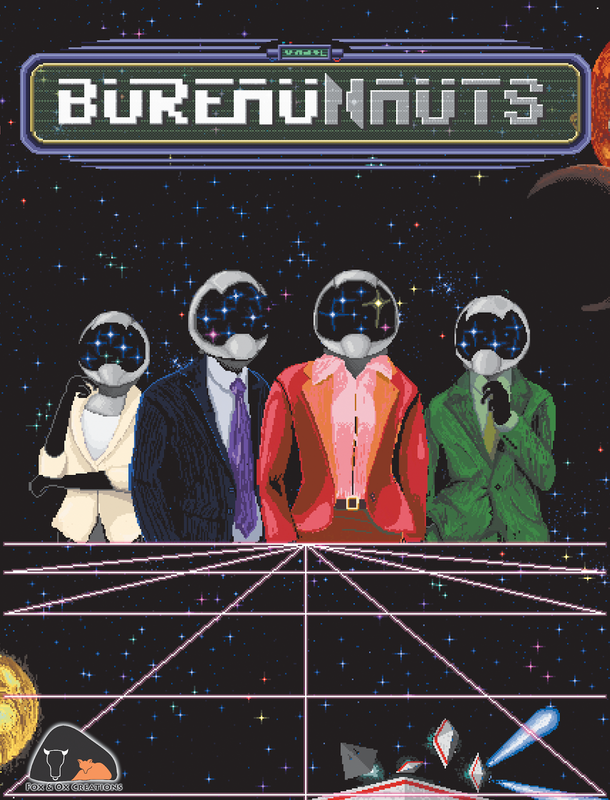 The pixelated artwork of Bureaunauts is not appealing to me, however I know that there are many gamers that enjoy this style. 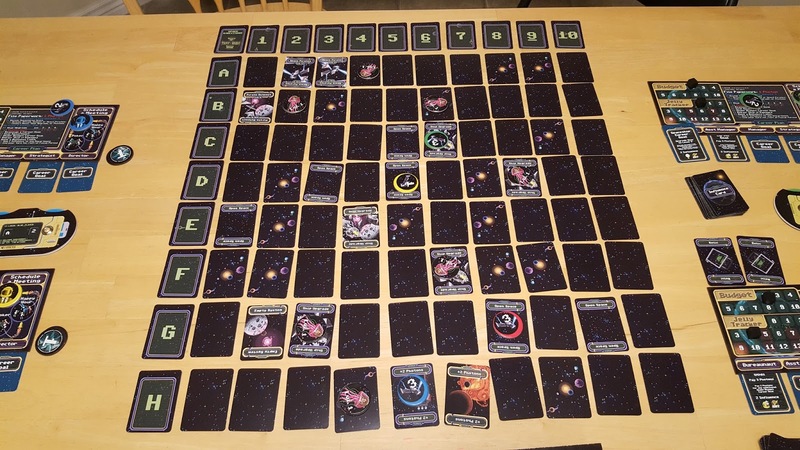 The graphic layout of the cards, player boards, etc. is great, icons are easy to follow and understand. As I mentioned above the final version of the game will be getting an upgrade to the components. This is good news as the player control dials were a little flimsy. Other than that I think the prototype components were decent so an upgrade should make them really good. I was really concerned when I first opened the box and saw the amount of components. I thought the game would have a long set up and game play time. To my relief set up was much quicker than anticipated and the game played quickly as well. You will need some serious real-estate in order to fit this one on your table, be prepared. The rule book I received is rather long, however I heard from the game's creator that the rules are getting paired down for the final version. That being said I found them easy to follow and understand. I only had to go through a couple times to get the hang of it and then hit it up a few other times for reference. I really like the premise behind this game—corporate ladder climbing—and instead of taking place on our boring planet it takes place in the nether regions of the solar system where work seems much more interesting. The mechanics in play here work well together. I especially like the hidden movement/action selection although there weren't too many times where players chose the same destination (since space is a big place). When there is a tie or players have chosen the same local a unique version of rocks, paper, scissors comes into play (don't worry it isn't as bad as it sounds). I really enjoyed completing the Career Goals in order to place influence cards in certain Department Heads. I would have like to have seen a greater variety in goals, however I have been told there will be more in the final version. 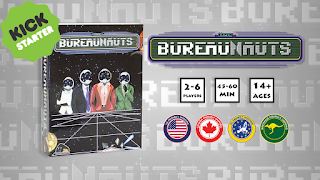 Each step that players take during the Fiscal periods is easy to follow and quick to perform, so Bureaunauts plays quickly. There is not a lot of down time waiting for players to make decisions which is a plus. I found that I could easily get a game in the 45-60 minute time frame suggested by the publisher. As mentioned above, once the end game is triggered players shuffle each Department Head Deck and draw cards randomly to determine the winner of the game. At first I was turned off by this mechanic as I thought that players who didn't play as well throughout the game could still win. I found that in theory it could happen but was rarely the case. I even tried an alternate voting method where the player with the most cards in a Department Head won that department. In most cases it created the same outcome (only without the possibility of a "come from behind win"). 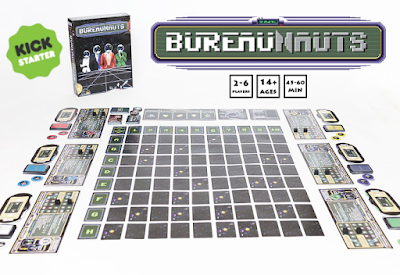 The game is easy to teach and quick to pick up by new players and younger players making Bureaunauts very accessible. The age recommendation is probably a little high at 14+, I would say 8 to 10+ would be reasonable. I really enjoyed the goal completion and influence placement. It reminded me somewhat of Aquire where players are choosing stocks to buy in order to gain majority control. The way you go about completing goals is captivating as well with a variety of different objectives. One thing that really bugged me during my game plays was turning over the space cards (the 8 by 10 grid of cards) as I explored. Let's just say there were many cards with damaged edges once we got done playing. The game's creator told me that this was an issue that they are working on and should be resolved with the final version. Mid game 8 by 10 space grid. Cards are tough to turn over. Besides the name Bureaunauts is a unique game with a combination of mechanics I have never seen used together before. 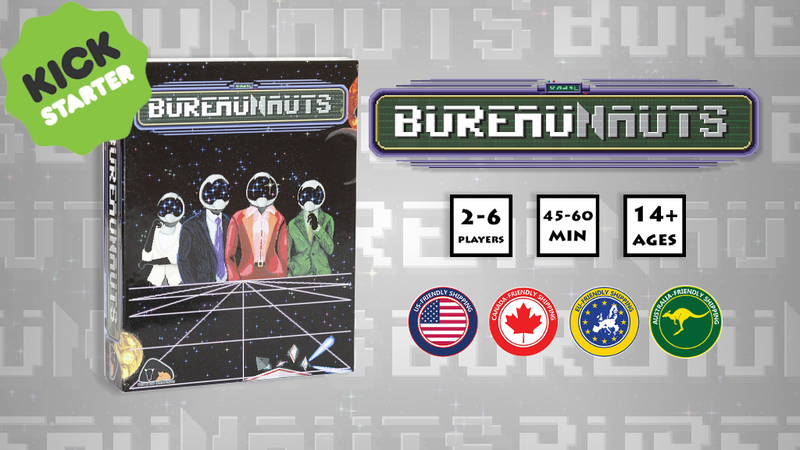 Hidden movement selection, exploration, combat, goal completion and majority control all wrapped in one package—Bureaunauts has it all! This is a game I could see going into my collection. Players who like Pirates Cove and Aquire will love Bureaunauts! I am giving Bureaunauts 7 out of 10 super meeples. Kickstarter Page: https://www.kickstarter.com/projects/247507164/1251873692?token=55bd9369 - Launches August 3, 2016. Nice review! I've had the pleasure of playing this game and I really enjoyed myself. In response to "The Bad" I have 2 words: Card Sleeves ;). Thanks Geordie! I was hoping the tiles were the answer. :) I know that could get expensive with 90+ cards. What were your impressions of the game?